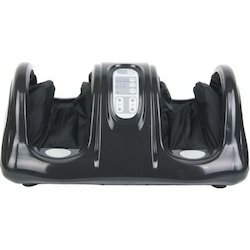 We are biggest supplier,wholesaler& Manufacturer of Leg massager. 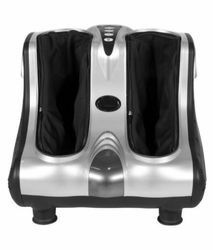 The Leg Massager contains 4 parts of kneading discs in one application to effectively massage your feet, ankles and calves. Collateral of strong kneading and vibrating action penetrates deeply into the muscles and boosts blood circulation. Further, we are offer personal preference of 3 kneading massage programs and vibration modes. The leg beautician is very easy to use and control with the help of buttons present on the switch panel. The product shuts off automatically in every 15 minutes to reduce energy wastage. In addition, leg beauticians come with a detachable fabric cover with a zip which allows easy cleaning and maintenance. The foot massage reflex therapeutics is the bequest of Chinese national medicinal field. It is known and summarized from the result of human struggling against the diseases in long period. It has a long history and was consummated day by day. The Leg Beautician contains 4 parts of kneading discs in one application to effectively massage your feet, ankles and calves. Collateral of strong kneading and vibrating action penetrates deeply into the muscles and boosts blood circulation. Further, we are offer personal preference of 3 kneading massage programs and vibration modes. The leg beautician is very easy to use and control with the help of buttons present on the switch panel. The product shuts off automatically in every 15 minutes to reduce energy wastage. In addition, leg beauticians come with a detachable fabric cover with a zip which allows easy cleaning and maintenance. 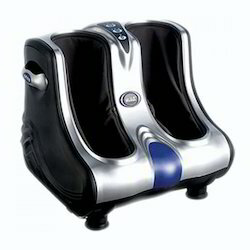 Looking for leg Massager Importer in India ?